What Does Palm's Subnotebook Foleo Mean for Mac Users? Palm announced its first non-handheld computer yesterday, the Foleo. 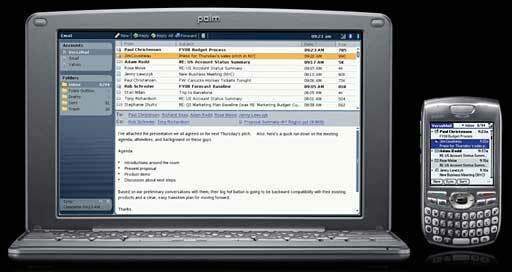 Palm is billing it as a "mobile companion" to your smartphone. The stated goal is to provide a much bigger screen for accessing the Web than any smartphone offers, and the Foleo can use many smartphones (particularly Palm Treo and Windows Mobile models) to access the Internet where WiFi isn't available. Looking at photos and specs for the Linux-based subnotebook, I have to admit my first thought was, "Why didn't Apple do this?" 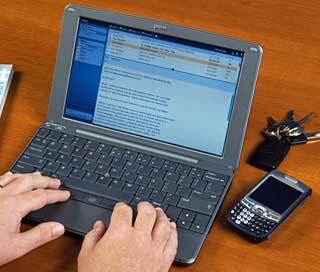 The Foleo has a 10" 1024 x 600 display and a full-sized keyboard. It includes WiFi and Bluetooth 2.0, which should make it easy to connect to a network or sync with your full-sized computer. It uses flash memory instead of a hard drive, has Compact Flash and SD slots for additional storage, and weighs under 2.5 lb. It supports 1024 x 768 on an external display or projector and has a single USB port. Palm claims five hours running on batteries, even with WiFi active. The included browser is Opera 9, and it will sync with the address book in most smartphones. Palm is vague on other details, such as which Intel CPU is used (cnet's Tom Krazit calls it "underpowered"), how much RAM the Foleo has, and its dimensions, only saying that it's under 1" thick. Based on photos, I'm guessing it's a fair bit under 1" thick. It doesn't include any type of optical drive, something Apple manages to pack into 1" thin MacBook Pro models and has included in 1" thin PowerBooks since 2001. One big question is how open or closed the Foleo will be, since it uses a customized Palm version of Linux - much the same complaint we're hearing about the iPhone. The Foleo doesn't have a trackpad; instead it uses a "nub" pointer built into the keyboard, something IBM introduced on the ThinkPad ages ago. The keyboard has a split space bar with an extra key in the middle that I suspect is the mouse button. 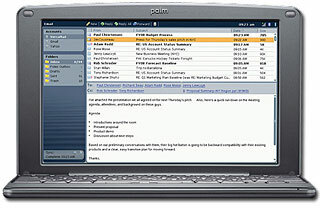 Palm is offering the Foleo at US$599 less a $100 mail-in rebate. Why they don't simply price it at $499 to begin with is beyond me. The Foleo looks good, and it has the WiFi and Bluetooth connectivity that could be used to work with a Mac. It includes DataViz's Docs-To-Go, which makes it compatible with Microsoft Word, Excel, and PowerPoint files. Early postings seem to indicate that it won't sync with calendars - time will tell. What if Apple were to enter the subnotebook market? Would a "MacBook mini" be very much different - other than running Mac OS X? The Foleo has a widescreen display, and 1024 x 600 would probably be usable with OS X, although it would feel tight with some applications. It dispenses with the optical drive, something Apple (the first to abandon the floppy disk) hasn't done yet. But to keep size, weight, and cost down, a lot of us would sacrifice the optical drive in a lightweight field computer. If it were a Mac, it would include an Intel Core CPU of some sort, and Apple probably wouldn't ship it with less than 1 GB of RAM (the Foleo is rumored to have a mere 256 MB). Apple is already looking at flash technology, and including Compact Flash, SD, and USB ports for portable storage is a good move. Were Apple to build a subnotebook, I suspect they'd avoid the "nub" pointer and stick with a trackpad, a technology they pioneered in the Blackbird PowerBooks and have used since 1994. And, being a Mac, I'm sure it would include at least one FireWire 400 port and 802.11n WiFi. At least one more USB port would be nice, and Apple hasn't built a Mac without ethernet since the Quadra era, so I'd expect that as well. My 5.3 lb. PowerBook G4/400 died an untimely death last summer, dropped a few too many times and sold for parts. It served me well for over five years, and it was adequately powerful for the work I did. I could replace it with a used PowerBook G4 with DVI video (the original G4 PowerBook had 1152 x 768 video, DVI models bumped that to 1280 x 854). Or I could up the ante to a 5.6 lb. aluminum 15" PowerBook with AirPort Extreme. The 5.6 lb. 15" MacBook Pro is a dream machine - and possibly more than I really need. The 5.2 lb. MacBook could be enough, with its 1280 x 800 display and Intel Core 2 Duo CPU. It's very tempting. But then I read about Tablet PCs, and I think how convenient it would be to work "slate style" when I'm sitting at the Macworld Expo keynote or at the airport. Not that I'd want to be stuck in slate mode all the time, the biggest drawback to the Axiotron Modbook (delayed to July at present). And then comes the Foleo, and I wonder if it wouldn't be small enough and light enough to use with the keyboard. And very affordable. But it runs Linux, not OS X - and that gets me thinking along the lines of this article. 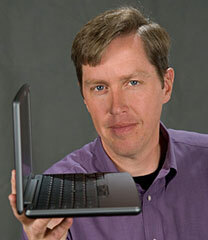 What could Apple do in the subnotebook realm, especially as flash memory is getting cheaper. Fortunately I don't have to decide until later this year. I really should have something portable before I attend the next Macworld Expo in January 2008. I'll continue to hope for a tablet MacBook - and continue to weigh my options if Apple doesn't release one. I'm looking forward to the Foleo, which could be the subnotebook that finally catches fire with the public. It will be interesting to see how well production units perform and how well it will integrate with Macs.